First off, I apologize for the crappily edited image. I couldn’t find any from the trailer that came out this morning so I had to make one myself and I’m not the best at cropping an image, and I didn’t want to resize it because that would distort it. So I trimmed what needed to be trimmed and left only one or two little defects in the cropping as you can see in the lower left hand corner. Like many people, I was hyped for Red Dead Redemption 2(Really, really dislike that name, but whatever.) and you can imagine that I was excited to see this trailer. And then... the trailer was only about a minute long and barely told us anything. It was more like a nature shot. Kind of like the World of Wonder series of videos for Final Fantasy XV. We didn’t really learn anything about the story from this trailer or even what time period it is. I mean, if it’s post Red Dead Redemption, then they have a very limited time frame to work with because the Wild West was coming to an end as the government and civilization rapidly grew westward. And if it’s set before Red Dead Redemption, then they have about 60 years to play around with, but then technology greatly moves backward. But anything I can say will all be speculation because we don’t really have anything concrete. Again, it was more of a nature trailer. Which, to be clear, the game looks absolutely gorgeous. Sure, it’ll be running at 30fps, but that’s A-OK for this sort of game. And the setting itself definitely seems to have moved at least a bit more eastward because of all the grassy plains and forested valleys. It’s not so much desert anymore. Needless to say, it looks leaps and bounds better than Red Dead Redemption did. I went back to play it yesterday and I really noticed all the rough edges that I didn’t see before. I guess the only thing I can really infer, story-wise, from this trailer, is that the seven main characters are likely outlaws. In the shots that you see them in, they have their faces covered like bandits would often do. And the narrator mentions that “When they come for you, you run.” That basically implies that they are on the run from someone, likely law enforcement. If I had to guess this is post-Redemption and the government is really cracking down on the remaining outlaw holdouts who refuse to let the West that they know die. 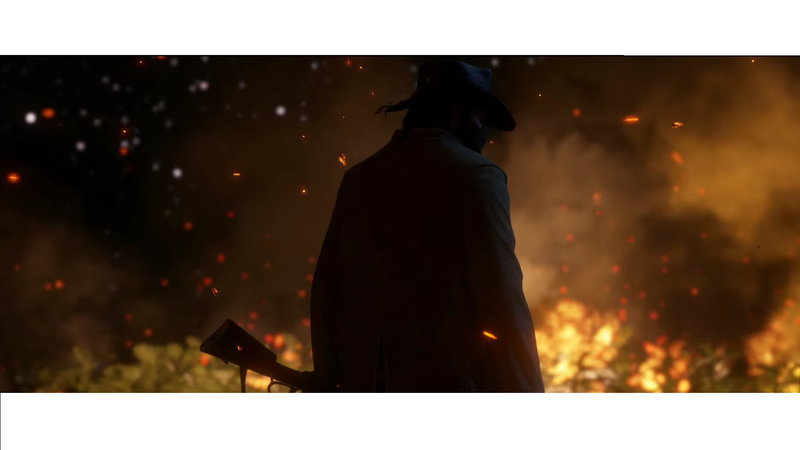 Redemption already showed up the shady and evil government officials, so my line of thinking is that Redemption 2 will have us fighting against the government. But that’s about it. We can be excited for this game now, but we likely won’t get a meaty story trailer for at least a couple of months, if not E3 next year. Rockstar really likes to draw things out, including announcing a PC release. I mean, come on now, that should be a given at this point. I mean, I accept that it will probably come in 2018, but the least you can do is tell us that yes, it is on the way at least.